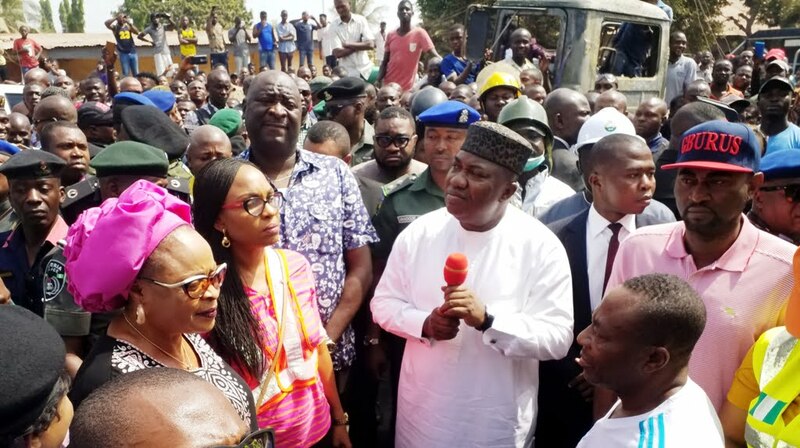 Governor Ifeanyi Ugwuanyi of Enugu State Monday evening fulfilled the promise he made to victims of the unfortunate fire outbreak that occurred in the morning at a petrol station along Nike Lake Road by Penoks Junction, Trans Ekulu, Enugu – to take immediate action to ameliorate their pains. Gov. Ugwuanyi who had earlier directed the State Emergency Management Agency (SEMA) to meet with the victims, when he visited the scene, thereafter met with them at the Government House and gave them financial assistance. One of the victims, whose boutique was burnt and who spoke on behalf of others, Mrs. Esther Okpara, disclosed that the governor gave the three affected shop owners the sum of N500,000 each; N250,000 to another shop owner with less damage and agreed to replace the burnt commercial bus and two tricycles for the owners. A mobile food seller and two tenants, according to her, got N100, 000 each from the governor while two Okpa Sellers, a Vulcanizer and one other victim got 50,000 each. Mrs. Okpara, who could not hold back her tears of joy, thanked Gov. Ugwuanyi for his benevolence and compassionate disposition to them, saying: “We have never had it so good”. Narrating her ordeal, she said: “In fact, I pray that all the days of my life, I will never live to witness such incident again. It was so terrible that we ran out of our homes but after the whole thing, we were surprised to see our governor immediately. “He came to see us and to see what happened. We thank God no life was lost. We give God the glory in Jesus Name. Amen. Above all, the governor took care of us. When he came, he saw our shops, the things that were affected in our shops. He didn’t stop at that; he invited us here to the Government House. He saw us one after the other and gave us cash gifts. “I remember the day we voted for him in 2015. It was drizzling but we went all the way to vote for him and he has never disappointed us. “We know that come 2019, we are going to vote for him again. He is a very good man. We thank God for him, for all he has done for us and all he has been doing in this state. He is the people’s governor and we know he is coming back to continue his good works”. Excited residents of the area had commended Governor Ugwuanyi’s administration for the swift intervention and expertise displayed by officers and men of Enugu State Fire Service in putting out the fire, without any loss of life.